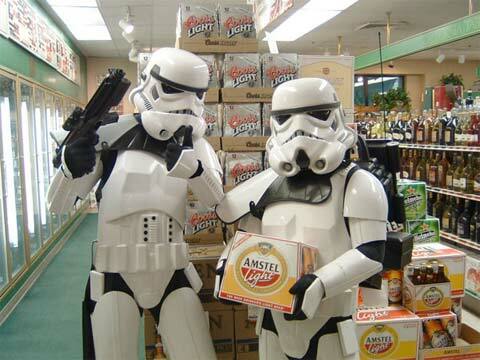 Aren't you guys a little too drunk to be stormtroopers? "Look! We got to the light side of the force! Teeheh!" In the time honored tradition, these cadets prepare for target practice. "It's just three and a half percent!" "I'd take that chance of success any day." Taller/senior trooper: "This is why Stormtroopers get a bad rap." T: "all you young troopers just want to party and when its time for combat you can't hit anything! And then there's the other thing...."
T: "Is your blaster in the cooler?"